Simulating rays with MARX is very similar to the steps needed to reproject ChaRT rays, and is only a matter of setting a couple additional parameters. In this example, a hypothetical point source is generated and projected on the detector-plane with the MARX software. Note that MARX was originally intended as a PSF simulator and not an observation simulator, but can be used to help in observation planning. 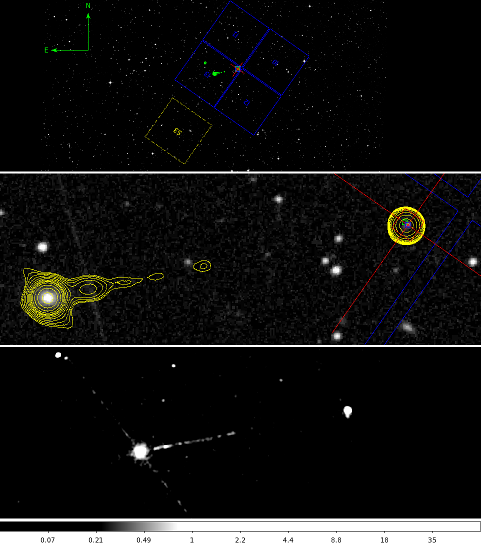 In this example, we will simulate an on-axis point source for a hypothetical observation; where the goal is to have good spatial resolution of the primary target; and secondarily, have a source in the field for imaging spectroscopy that is off-axis, which helps reduce pile-up by spreading the source's flux over a larger number of pixels. We will first define the source coordinates, in decimal degrees—where we use the position of the western lobe of the Pictor A jet, which is RA=05:19:26.204 [79.859546 deg], Dec=-45:45:53.69 [-45.765033 deg]—for our hypothetical source. *This sub-section is only needed if a specific telescope roll angle is needed. Otherwise, the user may just assume a roll angle of zero for the simulation by setting Roll_Nom=0. Before running the simulation, it is necessary to determine the nominal position of the detector for the hypothetical observation. The PRoVis and ObsVis proposal planning tools can both be used to help determine these values. PRoVis is used to examine the expected visibility of a target by Chandra over a period of time, and illustrates periods where observations are forbidden due to spacecraft constraints. Begin by going to the Target Parameters frame and enter the time period in the future of interest—in this particular example, spanning from 2016 Jan 01 to 2016 Dec 31—and then enter the target's J2000 coordinates. In lieu of directly entering the coordinates, the target name can be provided, and coordinates determined by clicking the Resolve Name button on top of the page. 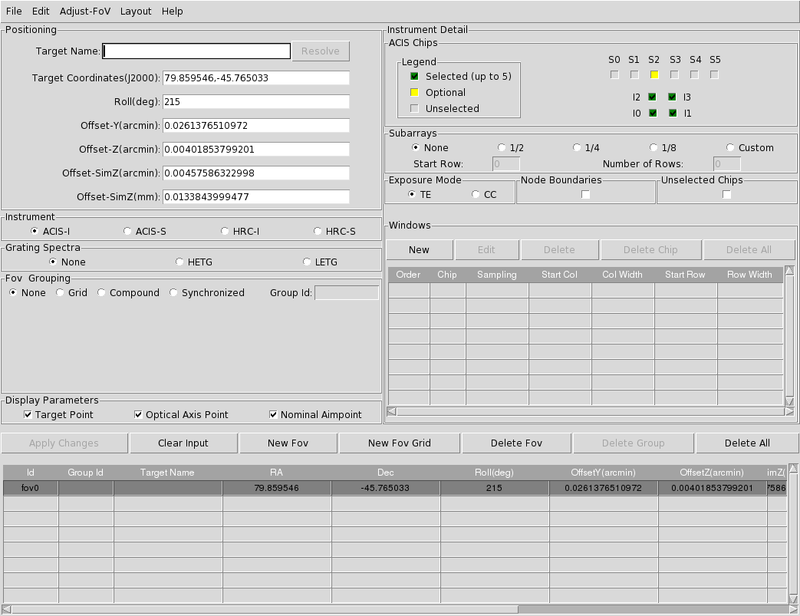 A visibility/roll/pitch plot is then displayed after clicking the Generate Plot button. 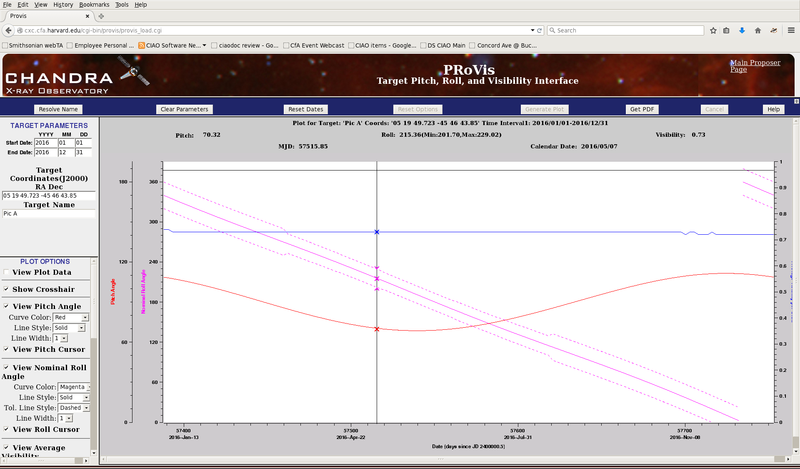 PRoVis plot of various spacecraft parameters for an observation of Pictor A over the course of 2016. The target is observable throughout the entire year with no restrictions. The visibility plot shows that the target source is observable throughout the entire year, with no spacecraft restrictions, having a maximum observational exposure length being roughly 75% of the Chandra orbital period. where the ObsVis GUI and a DS9 session are opened. To use the cataloged coordinates, type "PicA" (without quotes) in the Target Name box and click the Resolve button. Since the primary interest is to perform on-axis imaging, ACIS-I will be used, with the addition of ACIS-S3 optionally turned on for archival use. On the ObsVis GUI, click on ACIS-I under Instrument and then click twice on S3 under Instrument Detail. The Roll(deg) will be left empty, since the roll is unconstrained for the target coordinates, and we can explore various roll angles later. Then click on the New FoV button. A new Field of View (FoV) labeled fov0 (the default) will appear in the table at the bottom of the GUI and in the DS9 window, a DSS Server box will open loading a DSS field containing the desired target in DS9 with the Chandra field of view, for the specified chips overlaid. The blue boxes represent the active chips and the yellow, dashed box represents the optional chip for the observation. The red crosshair is centered at the entered target coordinates and the red box displays the size of the default Chandra dither pattern. The green circular box is the the telescope's nominal aimpoint and the blue circular box is the telescope's optical axis. The lobe of the jet emanating from Pictor A is located at roughly RA = 05:19:26.204 [79.859546 deg] and Dec = -45:45:53.69 [-45.765033 deg], so we may reposition the red target cursor to this position by going to the ObsVis GUI menu and selecting Adjust-FoV → Move, and the red crosshairs will be highlighted. Either drag the cursor to the new position or go to the DS9 menu Region → Get Information and edit the Center field with the lobe's position. Next, various roll angles can be experimented with. 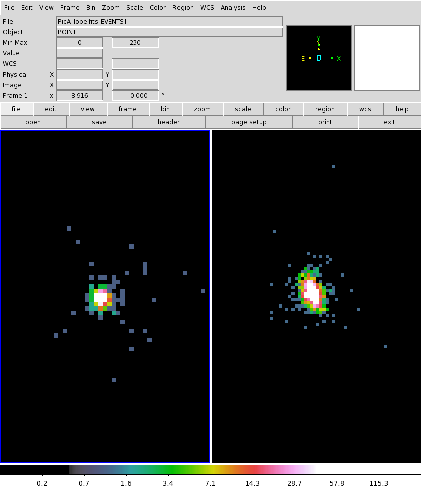 This can be interactively done by going to the ObsVis GUI menu and selecting Adjust-FoV → Roll (with Shiftkey) so that the entire detector array will be highlighted, and going to one of the corners of and holding the shift key, the cursor will change and left-clicking the mouse while moving the cursor will alter the telescope roll angle. A roll angle of ~215 degrees places the lobe near the optical-axis and aimpoint, and the Pictor A core near the center of the ACIS-I3. Zooming in on the target, it is seen that the nominal aimpoint (green circular box) is centered on the target, while the optical-axis (blue circular box) is slightly offset. But instead, suppose we want to center the optical-axis on the target, select Adjust-FoV → OffsetYZ in the ObsVis GUI, and the optical-axis is highlighted, so it may be moved to the target coordinates. While the optical-axis and nominal aimpoint will not co-align, the separation can be minimized by offsetting the SIM along the telescope's z-axis by select Adjust-FoV → OffsetSimZ in the ObsVis GUI, and moving the highlighted aimpoint. The ObsVis GUI after adjusting observation parameters. From the ObsVis GUI, the useful values—besides the target coordinates—for our needs are the Roll(deg) = 215 and Offset-SimZ(mm) = 0.0133843999477 fields, which will be incorporated into the MARX simulation. The nominal aimpoint position can be now obtained by selecting the Adjust-FoV → OffsetSimZ menu in the ObsVis GUI, and then Region → Get Information menu in DS9, to obtain RA = 05:19:26.416 [79.860065 deg] and Dec = -45:45:53.25 [-45.76479 deg]. Upper Panel: The Chandra field of view as defined in ObsVis, overlaid on a DSS field centered on Pictor A. Center Panel: Zooming in on Pictor A from the Upper Panel. The crosshair (red) and optical-axis (blue) centered on the jet lobe and the nominal aimpoint (green) is illustrated. X-ray contour (yellow) are overlaid to assist visualization. Lower Panel: Previous Chandra observation of Pictor A (ObsID 346), a 25.8 ks exposure on ACIS-S3. Additional information needed for the simulation is the observation date—which affects the contamination model applied to the detector—and the minimum number of counts to detect. Note that this is not the same as the total number of source counts, which would be included in the total counts detected. From the earlier PRoVis run, a roll angle of ~215 degrees corresponds to a date of MJD 57515.85, which corresponds to a decimal year of roughly 2016.35 for the simulation's TStart value. In this thread, a value of TStart = 2016.35 is used, which is sufficiently precise for MARX's usage. In this example, we will detect at least 1000 counts. The negative sign preceding the integer-value of the NumRays parameter sets the minimum total number of rays to detect. If a positive-value is used, then that value is the minimum number of rays generated by the simulation. 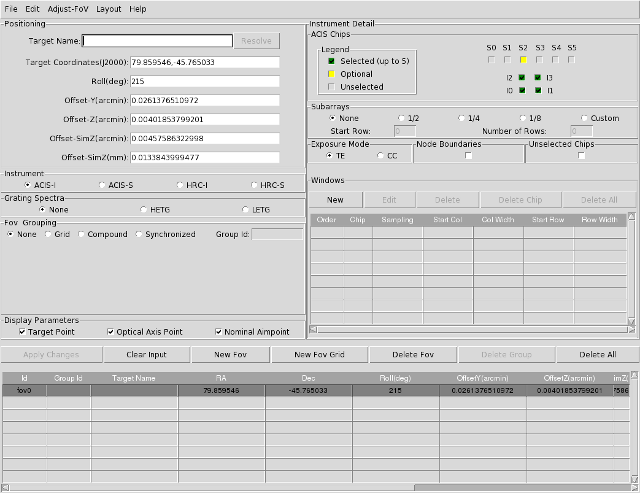 The ExposureTime is set to 0.0 to ensure that the correct exposure time to detect the set NumRays value is calculated. The DitherAmp_RA and DitherAmp_Dec parameters must be appropriately set for the dither model. The typical amplitudes of the Lissajous pattern are both 8 arcsec for ACIS observations and 20 arcsec for HRC observations. From the prior ObsVis work, the SIM is offset along the telescope z-axis by ~0.0133 mm, which is accounted for in the DetOffsetZ parameter. To define the source being simulated, a two-column ASCII spectrum file—with the first column as energies in keV and the second column as flux densities in photons/s/cm2/keV—or a uniform energy spectrum may be specified. In this example, a monochromatic energy of 2.4 keV for the point source is established by setting SpectrumType=FLAT, SourceType=POINT, and restricting the energy range of the uniform continuum to a single value, MinEnergy=MaxEnergy=2.4. The FEF/RMF used by MARX will subsequently affect the energy distribution of the detected rays (generally shaped like a narrowly peaked line spread function, centered at the selected monochromatic energy). When SpectrumType=FLAT, the total source flux is set by the SourceFlux parameter in units of photons/s/cm2. If an ASCII spectrum file is used, then set SpectrumType=FILE and the SpectrumFile parameter to the path of the spectrum file; the SourceType parameter also should be set. In this source mode, the SourceFlux parameter is used to set the overall normalization of the input spectrum. Setting SourceFlux to a positive, non-zero value will cause MARX to re-normalize the spectrum read from the ASCII file to the specified total flux; a negative value will cause MARX to normalize the input spectrum by the specified factor. Using SourceFlux=-1 will use the normalization inherent to the input spectrum. When simulating Chandra data, to avoid pixelization effects in the pseudo-events file, there is an AspectBlur parameter which should be set. Users may experiment with the appropriate values of AspectBlur; we suggest values of ~0.3 arcsec for ACIS and ~0.1 arcsec for HRC as suitable for typical data, based on a limited set of simulations. Should an aspect solution be needed for your analysis, the marxasp tool can be used with the internal dither model from your MARX simulation. The off-axis point source Pictor A core may also be simulated within the telescope's field of view, as is currently setup, by just updating the SourceRA and SourceDEC parameters, in addition to the OutputDir to avoid overwriting the previous simulation of the jet lobe. The core has coordinates of RA = 5:19:49.723 [79.957179 deg] and Dec = -45:46:43.85 [-45.778847 deg]. It may be also desirable to match the exposure time with the simulation of the lobe, in which case the ExposureTime parameter will be set to the total time of the lobe simulation (69278.677225 sec), and supersedes the NumRays parameter if ExposureTime is a non-zero value. In doing so, it may also be worthwhile to change the emitted flux of the core. In this example, assume that the core is 50% brighter than the lobe. The tool can now be run, as shown earlier. and similarly with the simulation of the core. Image of the pseudo-events files of the simulated 2.4 keV jet lobe (left) and core (right). When creating the events file, to include the pileup effects, use the --pileup flag to process the pileup simulation with marx2fits. *A bug in MARX 5.0.0, marxpileup introduces an offset on the source position, placing the source between 0.2-0.4 arcsec at 40 degrees from the readout streak, in the direction of the streak. This bug was fixed in MARX 5.1.0. The two pseudo-events files can even be merged into a single events file by using dmmerge. In lieu of using the built-in FEF to map from detector pulse height-space to energy-space, it is possible to apply a specific RMF to the simulation with the MARX post-processing tool, marxrsp, prior to running marx2fits. For proposal planning, a variety of responses are made available for simulations for imaging spectroscopy and grating spectroscopy. The effects of the ACIS CTI on the chips' performance may be estimated with these responses using the current operational mode at the -120 C focal-plane temperature. The marxrsp tool is optionally installed as part building MARX, and is dependent on the CFITSIO libraries, and not typically built by most users. If marxrsp is to be used, the $LD_LIBRARY_PATH environment variable must include the shared libraries directory path with the CFITSIO that marxrsp is built against. Warning: this simulation was not run with DetIdeal set to yes. The old pha.dat file in PicA_lobe_marxsim.dir, containing the pulse height spectrum calculated using MARX's internal redistribution function, will be renamed to pha.dat.BAK. Note, marxrsp cannot be used to process the output products of the marxpileup tool. marxrsp uses the binary output vector, energy.dat, to compute the new PHA value for an event; while the events produced by marxpileup are potentially the sum of multiple photons, so their true energies are unknown. The pseudo-events file can now be used, for example, to create an image of the PSF. This thread demonstrated how to generate simulations of unobserved sources with MARX and produce pseudo-events files from the results.